Everyone loves to feel loved. Getting nice comments from people is amazingly good for the soul. This last week alone I had two total strangers tell me how nice I looked and that made me smile- a big goofy smile too! It's that old chestnut where women are supposed to feel sexually harassed when a builder wolf whistles at them with a "alright darlin" added in for good measure. Should you feel offended? Perhaps you should but in my youth (sounding old again! ), it has happened to me and it made me feel good! It made me smile not wish to run out and burn my bra in protest! I think most people want to feel wanted, needed and special. But what about unwanted attention? What do you do when something is so attracted to your pale English body that when the buggers appear you run for cover? 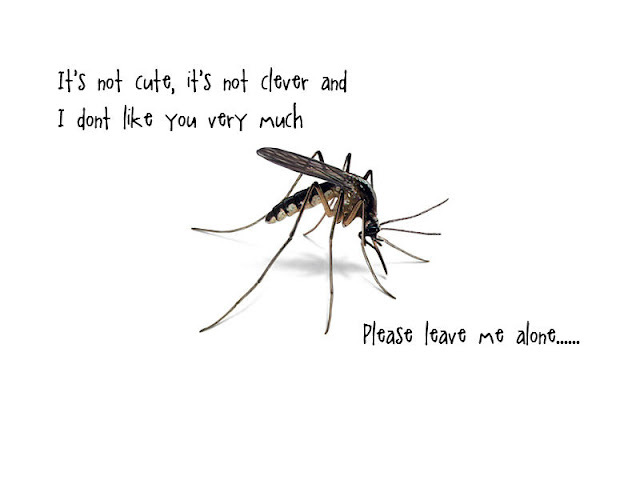 I am not talking about builders, workmen or any men for that matter, its bloody mosquito season again! I must have a sign above me saying "MOSQUITO CAFE". They silently hover up to me and do what they do. They either get caught in the act and squished immediately (bad karma maybe but it's a mosquito and one less is a good thing to me! ), or fly off only for me to notice the bite mark slowly rising into a lump. OK, you're saying what is so bad about that? It's what happens next that makes me loath the mossy! The bite will swell, get red, get angry, get itchy and make the area around it burn like its on fire. The heat that radiates from each bite is quite amazing. Oh and if I get bitten too many times, it makes me feel quite unwell. Feverish, sick tired etc etc, you get the picture. I read on the good old Internet that a bite can be itchy and swollen in bad cases for a few hours! I almost spat my coffee out at that statement. Try four days minimum! I have stuff for after I get bitten too and it only eases my discomfort for 10 mins at most and then we are back to stingy, angry heat and irritation. Last year I relied heavily on good old DEET but its not part of a healthy skin regime in my eyes so this year I have taken a few extra steps in order to win the mossy war. * Off Clip-On Mosquito Repellent- rather than spray it on my, this little device uses a fan to mist DEET around me, apparently keeping bugs 3m away. Possibly the smell will also keep people 3m away too- yet to see if this is true- I will report back. *All out war body coverage- this is not my best solution unless I want to get some serious looks from passers by but I will win this war and if this is what it takes, this is what I got! I also rely heavily on antihistamines as I am sure many other summer suffers do. I feel like I have enough ammunition to see me through but no doubt my will power will be put to test as I try not to itch- even though it will feel good- MUST RESIST! Do you have any anti mossy techniques- other than full body coverage?